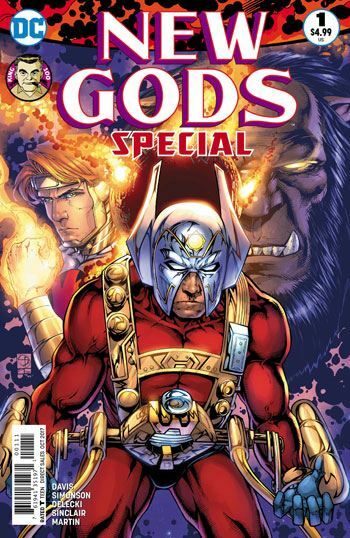 The New Gods Special is part of the Jack Kirby celebrations taking place this year. The issue contains two new stories, and some Kirby reprints as well. That’s a bit of a risky proposition. Do the two new stories come off as well as the Kirby ones. No, they don’t. They really are not bad stories, but even though the Kirby selections are two brief Lonar tales, and a Kalibak pin-up, they still don’t measure up. Shane Davis writes and pencils the lead story, which features Orion pitted against Kalibak, both of them being Darkseid’s sons. The tale takes place before the stories from the original New Gods series, as the pact is still in place, the peace agreement sealed by the exchange of Darkseid’s and Highfather’s sons. Kalibak breaks the pact, coming to New Genesis and forcing the “bugs” of that world to work on building a destructive energy pit. Forager gets a small role, informing Highfather of Kalibak’s actions, but Orion is unquestionably the star of the story. And, as I said, it’s not a bad story. But it doesn’t really develop Orion much, or show us anything new. The same could be said about the second tale, set during Orion’s youth, which is helmed by Walt Simonson. It does use the character of Seagrin. Seagrin only appears as a corpse in Kirby’s New Gods, and Orion talks about their friendship. So at least we do get a tale that shows their relationship. Sadly, the story is fairly short, and pretty straightforward. More of a training session than any super male bonding stuff. Don’t get me wrong, both of these stories were enjoyable enough reads, and in both cases there is some really great art to help them along. If one was not familiar with Orion or the New Gods, this issue would serve as a functional introduction. It’s just not quite “special” enough for me.